This map is informational only. No representation is made or warranty given as to its content. adidas Warrior Halloween Fall Classic and TourneyCentral.com assume no responsibility for any loss or delay resulting from such use. Many sports parks DO NOT have a street address. If there is no street address for a park or it is not known, it will not appear below. Teams are encouraged to double check with reliable third-party maps and/or DOT sites for construction, detours and delays. adidas Warrior Halloween Fall Classic assumes no responsibility for the accuracy of third-party maps or web sites. CLD Cloud Park ( BRANDT PIKE, HUBER HEIGHTS OH 45424). Take I-70 to Exit 38, Route 201/Brandt Pike (2nd exit East of I-70); Go South on Brandt Pike to the 10th traffic light; Cloud Park entrance is on the right; Fields 12 & 13 & 14 are on the right; fields 15a & 15b are on the left (baseball diamond outfield) as you enter the park. 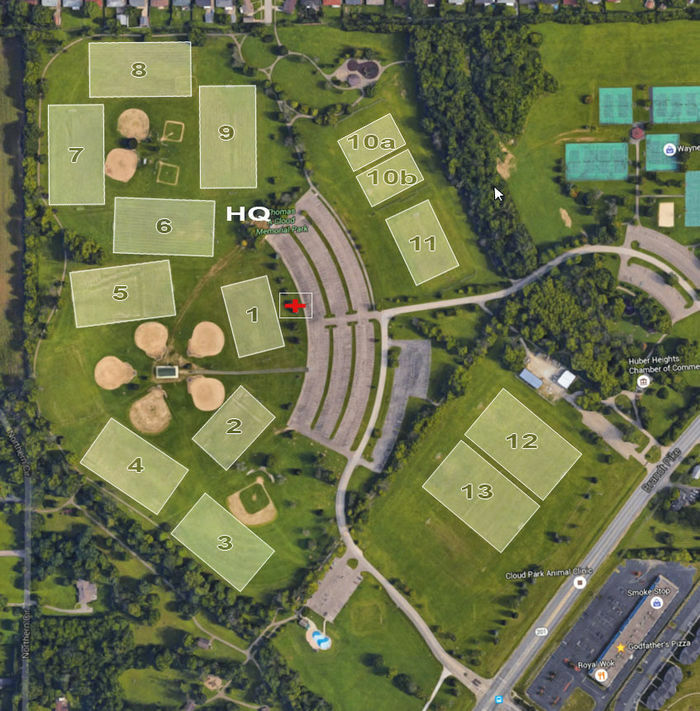 Fields 1-10a & 10b & 11 are in the back of the park. From East & Southeast, take Harshman Rd past Stebbins HS; about 0.7 miles; turn right (North) on Brandt Pike; park entrance is about 300 yards on left. From the South take Needmore Road Exit 58 off I-75, go East about 4 miles to Brandt Pike, turn North (left) on Brandt Pike; park entrance is about 300 yards on left. WSC (4110 FISHBURG ROAD, DAYTON OH 45424) Take I-70 to Exit 36, Route 202/Troy Pike (1st exit East of I-70); Go South on Troy Pike to the 5th traffic light, turn right (west) on Fishburg Road; Warrior Soccer Complex (WSC) entrance is on the right; From East & Southeast, take Harshman Rd past Stebbins HS; about 2.7 miles; turn right (North) on Troy Pike; go about 1.4 miles to Fishburg Road, turn left (west), WSC entrance is about 1.0 miles on right. From the South take I-75 north to Exit 57, turn right on Wagoner Ford Road off I-75, go North about 4 miles to Fishburg Road, turn East (right) on Fishbug Road; main Park Entrance is about 0.3 miles on left. NOTE: There is a exit ONLY from WSC at 0.2 miles from Rip Rap Road & Fishburg intersection. Enter at the Main entrance. NO Pets allowed. Fields are visible from Fishburg Road. ENTER ONLY at the MAIN entrance and EXIT ONLY at the WEST exit off Fishburg Road. -Speed limit is 5 MPH! Please watch for our children. -Please print a copy of the field maps for ease of finding your field. Please do NOT park in handicap spaces unless you have a person that actually needs to use that space. -The Main entrance drive is Two-Way on the east/north/south of the complex with the west drive ONLY ONE-Way going south to the west side of the site exit. -Fields 1-4 (8v8) SOUTH parking is an immediate left turn after entering site. Exit to the southwest ONLY. -Fields 5-10 (6v6) EAST parking (go straight into site at Main entrance) parking is on both sides of the main road. 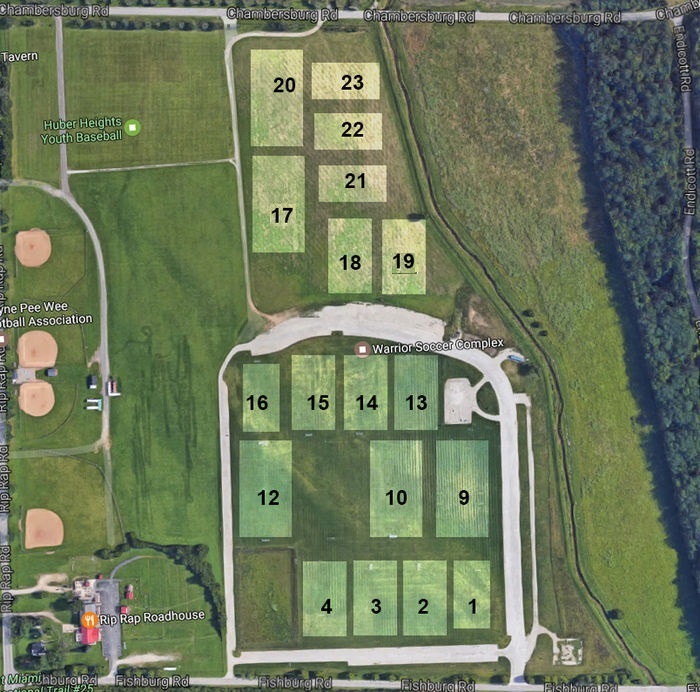 -Fields 13-16 (8v8) parking at NORTH lot at top end of the complex with ample parking. -Fields 11-12 (11v11) enter at the Main entrance and drive completely around the site to the WEST parking lot. The WEST lot is one lane that is DIAGONAL parking only. Leave the park heading SOUTH to the exit. -The Warrior Complex has ample parking with a lot of overflow parking around the circle drive. -Police Cadets are available to help maintain traffic control. -Please NO PETS allowed at the WSC Complex.